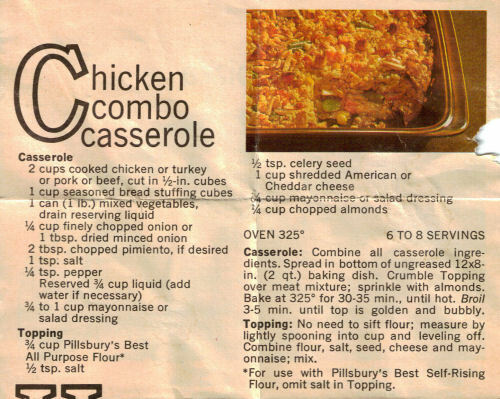 This recipe is from a Pillsbury Idea Recipes sheet and was found in a large collection, date unknown. Recipe is typed below along with a scanned copy. Casserole: Combine all casserole ingredients. Spread in bottom of ungreased 12×8-in. (2 qt.) baking dish. Crumble Topping over meat mixture; sprinkle with almonds. Bake at 325° for 30-35 min. until hot. Broil 3-5 min. until top is golden and bubbly. Topping: No need to sift flour; measure by lightly spooning into cup and leveling off. Combine flour, salt, seed, cheese and mayonnaise; mix. *For use with Pillsbury’s Best Self-Rising Flour, omit salt in Topping.